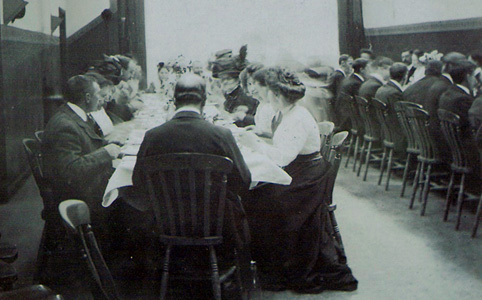 A ‘Sowmans Dinner’ held in the New Hall, High Street, Olney possibly around 1912. Local reports indicate that this hall became the Electric Cinema in 1919. No-one positively identified, to date, in this photograph! A visit by the directors and staff of J W & E Sowman to West Mersea, Essex on 23rd August 1933. The three Sowman founding brothers are seated in the centre of the first photograph. Albert Wiffen and Stanley Lord, respectively, are seated to their left. 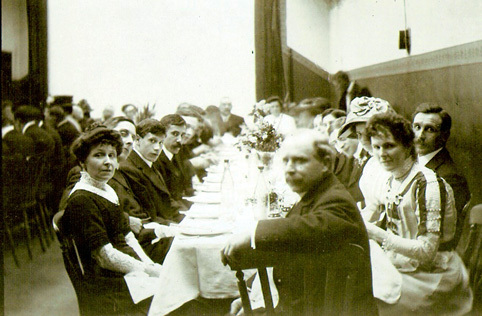 The wives are shown seated in the second photograph. In the lower photograph, Clarrie Coles is third from the right in the front row. We have also been informed by John Sanders that the gentleman seated in the second row at the far right hand end is George Allsopp and the lady in the white hat also seated in the second row and fifth from the right hand end is Ethel Sanders (nee Horne) – John’s grandmother. Ethel Sanders managed the China Shop. The ODHS could use some more help in the identification of the staff in these photographs, as the majority have yet to be identified. 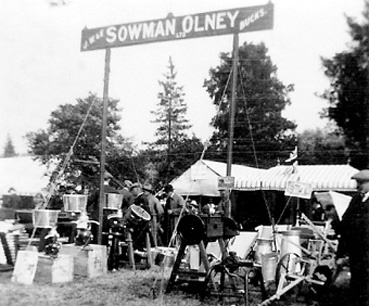 Sowmans always exhibited at the Bedford and Bucks Annual Shows. The Bedford Show was held at Cardington Road and the Bucks show was held at Hartwell Park. 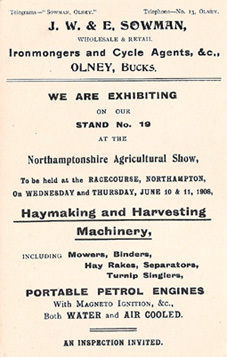 A postcard (see below) indicates that in June 1908 Sowmans exhibited at the Northampton Show which was held on the race course. 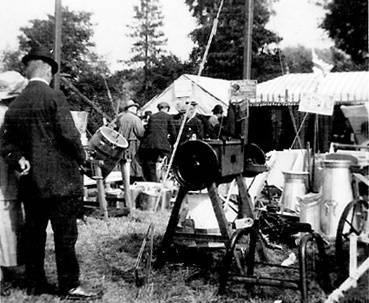 Exhibiting at such prestige agricultural shows was an important business opportunity for Sowmans, as they were a major social event for local farmers. Each show was a major undertaking and involved extensive preparation and support.